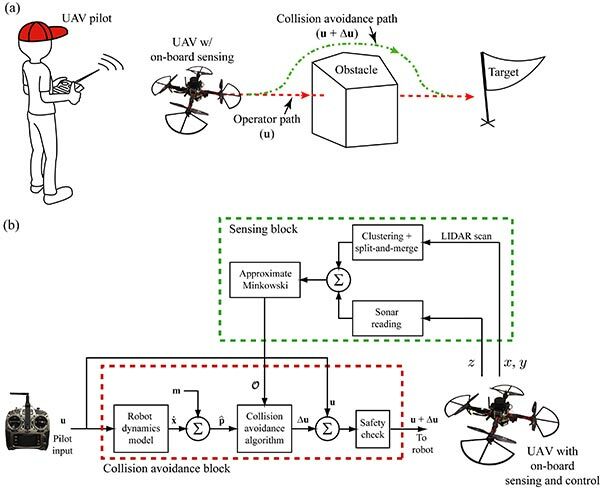 New article entitled, “On-board model-based automatic collision avoidance: application in remotely-piloted unmanned aerial vehicles”, by D. Bareiss, J. R. Bourne and K. K. Leang was recently published in Autonomous Robots. This paper focuses on real-world implementation and veriﬁcation of a local, model-based stochastic automatic collision avoidance algorithm, with application in remotely-piloted (tele-operated) unmanned aerial vehicles(UAVs). Automatic collision detection and avoidance for tele-operated UAVs can reduce the workload of pilots to allow them to focus on the task at hand, such as searching for victims in a search and rescue scenario following a natural disaster. The proposed algorithm takes the pilot’s input and exploits the robot’s dynamics to predict the robot’s trajectory for determining whether a collision will occur.Using on-board sensors for obstacle detection, if a collision is imminent, the algorithm modiﬁes the pilot’s input to avoid the collision while attempting to maintain the pilot’s intent.The algorithm is implemented using a low-cost on-board computer, ﬂight-control system, and a two-dimensional laser illuminated detection and ranging sensor for obstacle detection along the trajectory of the robot. The sensor data is processed using a split-and-merge segmentation algorithm and an approximate Minkowski difference. Results from ﬂight tests demonstrate the algorithm’s capabilities for tele-operated collision-free control of an experimental UAV. Collision avoidance for tele-operated UAVs: A UAV pilot controls the aerial vehicle and provides input u. When a collision is detected with on-board sensing and state estimation, the algorithm produces an input du that augments the pilot’s input u to steer the robot away from the obstacle. The control block diagram includes the sensing block and the collision avoidance block where the pilot’s input u is passed through the dynamics model to obtain the estimated trajectory ^p along with uncertainty in the motion model m. This trajectory is checked for collisions against the obstacles O. If a collision is detected, the algorithm calculates a change in input du to avoid collisions. If the input u + du is deemed safe, it is then passed to the robot. 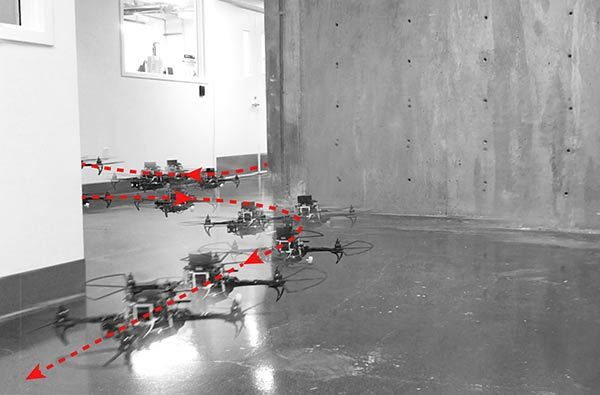 Experimental results showing aerial robot flying through an “S”-shaped hallway. Automatic collision avoidance: This video shows aerial robot with automatic collision avoidance approaching a wall. Automatic collision avoidance: This video shows aerial robot with automatic collision avoidance approaching a corner. Automatic collision avoidance: This video shows aerial robot with automatic collision avoidance navigating around obstacles. Automatic collision avoidance: This video shows aerial robot with automatic collision avoidance navigating an “S”-shaped hallway.